Interesting article. You and I have had many a conversation on the ups and downs of friendships. I made a conscious decision when I turned 40 that I will nurture my friendships, communicate with those I feel have slighted me and cut out those who only bring negativity. Btw, you four ladies are look the same albeit more polished with age! Really enjoyed this topic as I think everyone goes through this cycle of friendship of being best buddies and then falling out . Def.agree with no one really has the time for drama ,so live and let live has always been my motto . At times we do need other friends to step in and clear the misunderstanding or conflict but it always happens that person becomes the bad person !talking from experience . I seriously think ,communication is the key and if that isn’t helping then part different ways and be civil when seen in public . 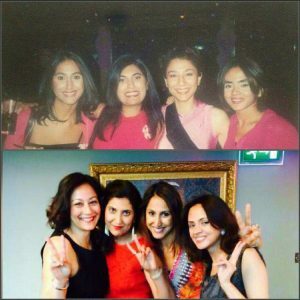 How sad that this continues in our 40s..think of all the aunties we know who can’t resist a bit of opinionated diarrhoea … some character traits don’t improve with age…. yesterday I was discussing with friends if you would tell another friend if they let you down. Interestingly we all had different answers based on expectations…. You know.. Sometimes I think our attempt to simplify our lives, as we get older, results in more drama in the friendship stakes! As we get older we become less tolerant of bullsh*t and are more likely to cut people off/hold them to account. Hence mote drama!